Crack is a very important problem around the world. In the 80s, this drug was very popular in the US and Europe, but in the 90s its use declined. Now, crack is resurging again. Crack is very popular in inner cities and poor environments since crack is cheaper than cocaine, which was consider the drug of the middle class of society. 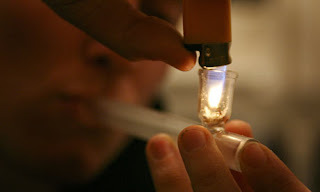 The fact that crack is smoked has contributed to the success of this drug, since snorting or injections are considered a method associated with “junkies”. Crack, also known as cocaine hydrochloride, is made in a process called “freebasing”. In this process, the cocaine is mixed with ammonia or baking soda to create crack powder, rocks or chips, which are later sold in quantities of 300-500 mg and smoked by addicts in 2-3 inhalations. Crack refers to the sound that may be heard when the drug is smoked. Since crack is smoked, crack produces its effects immediately upon consumption. Actually, crack only needs 19 seconds to get to the addict’s brain through its incorporation in the blood stream through the lungs. Two minutes after consumption, the addict feels euphoria, grandiosity, pleasure, increased energy, constriction of the blood vessels and social inhibition, but crack also increases blood pressure, heart and breathing rates, damages the nose and lungs, causes anxiety, hyperactivity, convulsions, psychosis, hallucinations, violent behaviors, nausea and heart attacks. Because crack is rapidly absorbed by the body, its effects are felt more quickly and intensely; however, the effects are also shorter. The short time required for the absorption also increases the risk of overdose, leading to coma, convulsions and death. Crack affects the sympathetic system, which increases heart and breathing rates, and the parasympathetic systems that are responsible for the opposite. Actually, crack mimics the neurotransmitters involved in these systems. Crack releases all the dopamine at once (producing an intense, short pleasurable and well-being feeling) and then blocks the process by which the dopamine is transferred back to the neuron that released it. As a consequence of this, dopamine accumulates in the gap between neurons and keeps affecting the neuron instead of stopping its effect. Long-term crack abuse reduces the amount of dopamine in the brain or dopamine receptors and neurons need crack to communicate between them, increasing the addiction. In addition, when crack is combined with alcohol, it has been shown that the liver produces cocaethylene; this is a substance that magnifies crack’s effects and increases the risk of sudden death by cardiac arrest. Many treatments for crack addiction have been useless since there are no medical treatments, and this is because cocaine withdrawal doesn’t produce evident physical symptoms. The withdrawal is characterized by psychological effects, and at the beginning it appears as though the drug was not addictive and no medical treatment was required to overcome it, with just an addict’s determination being enough. But the truth is, which has been explained above, crack consumption produces biochemical transformations in the addict’s brain and these changes modify addicts through behavior and feelings, and craving becomes incontrollable. A proper treatment begins with the understanding of the biological, psychological and social factors involved in the addiction and user’s life. After that, the detoxification process must be started. However, the traditional treatments just control the withdrawal symptoms and the final goal is to get a free-drug body. In more advanced treatments, the detoxification is not just the cleaning of the body without the side effect of the withdrawal, but the treatments also try to fix the brain damage caused by the drug, as well as the cognitive and affective functions. Therefore, the treatment is not only the detoxification, is also the neurological regulation and restoration of the neurological tissue affected. Both aspects must be treated; the withdrawal symptoms are a very difficult barrier and this is the cause of the failure of many treatments. During this time the addict’s brain doesn’t produce the natural neurotransmitter dopamine and doesn’t have a drug that replaces the neurotransmitter, therefore, the brain doesn’t work properly and medication is needed to have success and avoid the depression, insomnia, irritability, etc. and finally relapse. However, it is necessary to have a non-pathologic neuroadaptation. This neurological treatment is carried out pharmacologically under the strict supervision of medical and psychology experts. With these treatments the craving and anxiety disappear, and the cognitive and affective process are restored. Restoration of the serotonin and dopamine-based systems is needed to get a total, functional and successful recovery of the addiction. Failure in any of these points seriously endangers the treatment.